The N&W's June 1949 excursion from Columbus to the Ohio Midland Power & light Railroad, a 13 mile third rail line that delivered coal from Groveport (C&O) and Obetz Jct. (N&W) to the Pickway Power Plant. Once on the OMP&L line at Obetz Jct. the four passenger cars had a steeple cab locomotive attached to each end of the passenger train for the ride to Groveport at one end and the power plant at the other. The last time a passenger train would ride the reminder of the Scioto Valley Traction line. Photo from the Alex Campbell Collection. As long as there was passenger train service through Columbus there were train excursions; employee picnic specials, trips to sporting events and the Ohio State fair, and trips to conventions. The Columbus Dispatch and Ohio State Journal newspapers sponsored many train trips for their newsboys, often to Cleveland for sports events. When the coal miners shut down for their two week vacation each summer the PRR would run a trip to Cedar Point on the Sandusky Branch. The list of past rail excursions is endless. Starting around the time of the Second World War railfan groups began sponsoring rail excursions. The Central Ohio Railfans' Association (CORA) under the leadership of Nick Underwood was one of those sponsors. The National Association of Railway Business Women was another sponsor. In the 1960s the Ohio Railway Museum would sponsor trips as a way to raise money for the museum. The ORM excursions included trips to Cedar Point, Oglebay Park in Wheeling, WV and Detroit. The C&O and B&O were especially willing to handle rail excursions. The C&O Hocking Valley line through southern Ohio was a favorite route. The 1938 trip on the Ohio Public Service interurban between Toledo and Marble Head using Wooden interurban 21 was significant for Columbus railfans. After WW II the car would come to Columbus and be the seed for the Ohio Railway Museum. In 1950 several Columbus railfans traveled to Milwaukee for the National Model Railroaders' Association convention which included a ride on the Milwaukee Rapid Transit & Speed Rail line. It was on that railfan trip that two interurban cars collided head on near Hales Corners. One of the Columbus railfans, Harold Durflinger, was filming out the front window of one of the cars when the second car came into view. He jumped at the last minute. While injured he surely would have been killed if he had stayed with the car. We watched his 8mm film of that car coming into view, at ORM meetings, many times. This wreck precipitated the end of the Speed Rail Line. 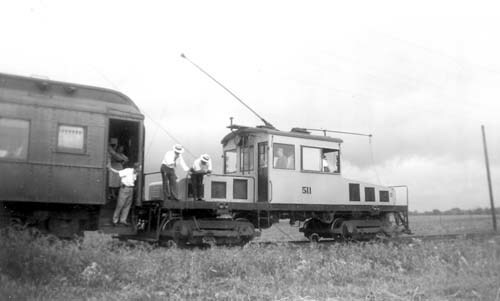 After the interurban line was abandoned the president, Jay Maeder, gave the ORM his Kansas City Birney streetcar 1545. The Burney was a fun car to operate, a real four wheel Toonerville trolley.